Electronic Health Records are changing the face of medicine. Initially, simply providing a repository and ubiquitous access to patient data across the care continuum; modern information systems now automatically analyze these available data in real-time to improve care. This deeper set of new data recorded electronically in the electronic medical record (EMR), automatically supplied by intelligent medical devices, imported in real-time from diagnostic labs, and now even provided by patients themselves opens an entirely new door into the future of medicine: big data is now the raw material of innovative real-time systems analysis helping to improve patient outcomes and reduce healthcare spending. A recent study by Brigham and Women's Hospital revealed that important key physiologic factors that predispose a patient for multi-system organ failure can be detected when patients’ vitals are closely monitored and tallied. Computer systems that continuously record patient vitals can thus theoretically be used to identify patients that are at risk for organ failure by analyzing their physiological data. The researchers suggest that such systems could be used throughout hospitals to alert healthcare providers to potential “impending organ failure” for quick intervention. Big data may also enable doctors to better and more efficiently treat chronic diseases. Historically, doctors were limited on the amount of patient history available to them, which can hinder progress when planning care for chronic disease patients with multiple symptoms like autoimmune diseases. With EMRs enabling rich electronic documentation of patient information, decision support systems can supply doctors with correlative information that help them link together missing puzzle pieces in ways never before possible. Physicians can now choose and tailor more effective treatments providing truly personalized medicine. A complete picture of historical treatments, longitudinal diagnostic data, medical history, and precise medication information empowers clinicians to provide more efficient and effective treatment of chronic disease patients that can cut costs and while reducing the potential for side effects and increase quality of life. Similarly, the promise of big data can provide more comprehensive and sophisticated intelligence to help avoid problems with drug interactions or adverse affects proactively by analyzing a broader set of current and historical patient medications, drug allergies, and contraindications. Readmissions are another target for cost-cutting and overall improved care. Research shows that many readmissions can be avoided when more actionable information is available to both to patients and their providers. Prior to discharge, busy nurses and physicians don’t often have the luxury of scrutinizing each patient as deeply as possible before releasing them. Once again, big data can come to the rescue by providing concise, real-time, and correlated data for more efficient decision support. The researchers from Brigham’s and Women’s Hospital suggests implementing computer algorithms to analyze patient data to determine who is at risk for readmission, and flagging those patients in the system. In the future, researchers hypothesize that predictive algorithms could further cut costs on the most expensive patient care. The idea is, computer algorithms that analyze even larger chunks of data per patient, learn, and provide progressively more proactive actionable information, particularly for those treatment plans that may be high-cost and care critical. Data, algorithms, and intelligent easy to use information systems paint a most promising future and strategy to improved intelligent patient care while potentially mitigating the ever increasing costs of healthcare. 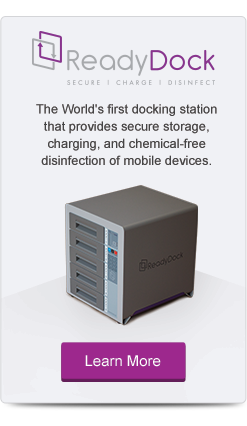 David Engelhardt, Founder and President of ReadyDock, though some people call him our "Mobile Device Disinfection Specialist!" He has over 28 years of experience in software and hardware solutions development in healthcare and manufacturing, with a particular focus on mobile technologies. David is passionate and committed to providing safe and workflow-efficient methods to enable clinicians and patients to enhance care through the use of innovative technologies. In the small window of time when he is not working or spending time with his amazing wife and daughter, he can be found playing USTA tennis, collecting vinyl records, and shaping music and sound in his recording studio. 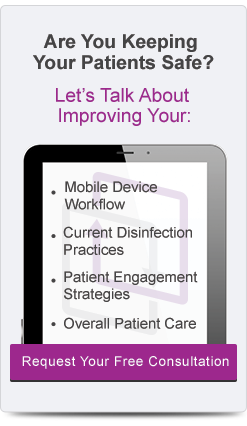 Get the latest disinfection tips, trends, and news directly in your inbox.